As the sun sets on the magical shore of the Black Sea and casts its last rays across the water, all Nora Teodoru can think about is pursuing her dream of becoming an accomplished artist - and of her love for Gigi, her childhood boyfriend from the Turkish part of town. But story clouds are gathering as life under Dictator Nicolae Ceaușescu becomes increasingly unbearable. His secret police are circling, never far from the young couple's doors. Nora and Gigi make plans to escape to Turkey, but nothing can prepare them for the events that follow. Five years later, the Romanian revolution is over, and Nora is on her own in Paris trying to make it as an artist. But then Gigi unexpectedly reappears in ther life - and they are faced with shocking revelations about each other. Set in the Romanian town of Mangalia a few years before the revolution, Black Sea Twilight is the story of young Nora Teodoru, her family, her dream of becoming an artist and her love for Gigi. However, life in a country regulated by a tyrannical leader and the secret police is not as simple and innocent as it may appear, and every single act can have far-reaching consequences on one’s life forever. I was first attracted to that book when I caught the glimpse of its wonderful cover. It looked like a painting, with a mosque and the sea suggested in the background in different shades of green and in the foreground is a girl seen from behind. 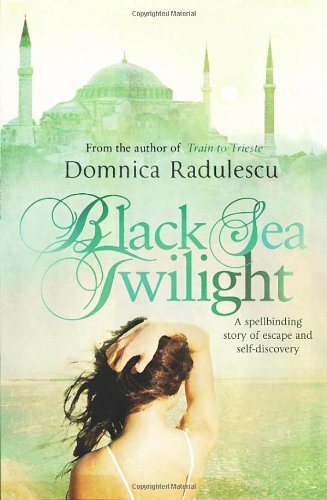 Then, the title, written in fine and shimmering font: Black Sea Twilight, something smooth, romantic and poetic. As I read the synopsis featured on the back cover, I immediately thought it suited this picture. Moreover, the mosque suggested mix of cultures, something a particularly enjoy reading about. Once I greedily finished reading the last page, I have to admit that I was completely right. Black Sea Twilight is everything I had imagined, only better. It is a story about life in a difficult country, about art, about exile and different places in the world, and about love. The first part takes place in Mangalia, a Romanian city situated by the Black Sea. There live different kind of people, from Romanians to Turks and Gypsies. Domnica Radulescu portrays a life full of colours and sensations as we get to know her characters better. Nora and Gigi develop slowly and so does their relationship. From the innocence of childhood, they will move to the realisation of the impact one’s act can have on their future under dictatorship. Through a number of short episodes told on a more or less chronological order – with a few flashbacks and explanations about the past – we are given a portrait of these moving and charming characters as well as a representation of this unusual town with its blend of cultures. The story alternated between extremely representative descriptions full of images and feelings and little anecdotes which may seem irrelevant at first sight, but then make sense in the characters’ life as we discover what happens. As Nora and Gigi come from a different environment, we are led through a mix of Turkish and Romanian traditions that we can easily compare. What is the same for everybody, though, is the threat of the State, the leader and the secret police. Freedom is a myth there, as the reader will soon discover while visiting Mangalia, Bucharest and other smaller places. Nora’s story is the main focus of the story, but we also meet a number of other characters, each of them with their own personality, each of them special and moving in their own way: Valentin, Anushka, Agadira, Gigi’s parents, Nora’s relatives, Didona, Marița… It is the human presence that brings life and warmth in a restrained and unfree society. The grey landscape that could be the reflection of the political life is actually full of shapes and colours, echoing Nora’s desire to become a famous artist. Thus, art is a central point of Black Sea Twilight: the painting, the drawing, but also Valentin’s music. The author’s writing style is perfectly adapted to the theme, as it is poetic and easy to read, with many details and beautifully arranged sentences. The reader is involved in the story as if he were witnessing Nora and Gigi’s flourishing love, their hopes, their fears, and their innocence. The second part is darker, as if it were reflecting the dictatorship that is becoming more unbearable day after day. Tied by their live and friendship but, most important of all, by their hope for a brighter future, the characters decide to escape in order to obtain freedom and to find a better place for their dreams to be realised. However, this enterprise is extremely risky and they need strength, courage and luck to get through with it. This is when the tragedy happens and each of them has to pursue their own way and build their own future. My only regret at that point of the book was the blurb, which I said gave away too much information. We know some of the events that will take place in the third part of the book and I felt it was a shame to spoil some of the suspense and expectation that could have been created otherwise. Yet, thinking about it, I do not know what should have been written in order to arouse the readers’ curiosity. It is true that Black Sea Twilight is an unusual story, focusing more on the characters’ psychology than on the action itself. There are no real turns or twists, yet the story is unexpected. There is not a climax everybody has been waiting for as tension built up over the pages, but a few acts that are decisive and life-changing and that occur smoothly, almost without our noticing it. Nora and Gigi are ordinary people and anybody can identify themselves with them. However, given the political context, their story is different from anything most of us can imagine. It is something moving and difficult to imagine if you have not experienced such turbulent epochs. The author could use this opportunity to criticise the regime and spread propaganda, but she does not fall into the trap. By just describing ordinary people’s lives, she lets us decide and make up our own opinions on the subject. The theme of exile is also examined during Nora’s journey to Turkey and then to France. These passages are extremely poignant and I was moved. It is only at the end of the story, when I read Domnica Radulescu’s short biography that I understood why her description are so vivid: she had experienced it; she was in the same situation as her main characters some years ago; she was a refugee. Mixed with the characters’ psychology and the vivid descriptions, Black Sea Twilight is a poignant story about self-discovery, the pursuit of one’s dreams and love. Domnica Radulescu found the right words to describe the Romanian revolution in both an attractive and simple way, through two young people’s eyes. The blend of cultures is showed through foreign words and sentences, namely in French, Turk and Romanian, but also through a great range of details and cultural references. Readers will enjoy the development of a nice love story, of a beautiful town by the sea, of exile and then a glimpse of Romania under Ceaușescu. More experiences readers will discover an incredible number of cultural and historical details. A wonderful novel raising questions about love and freedom. Thanks to Mum for lending me this book.